* Synchrony Bank 6 Months 0% No Interest Financing. Equal Monthly Pay plus any applicable taxes. Apply online. Transaction Code 106 Synchrony will advise you of your maximum amount or full credit that you can use towards purchase. 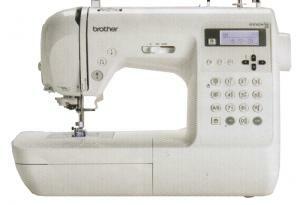 The Innov-ís 80 showcases the latest sewing technology in a portable size and at a very reasonable price. This lightweight machine is packed full of features, which is great for beginner and experienced seamstresses alike. Make a fashion statement and let the Innov-ís 80 be your voice! With its diverse selection of decorative stitches, buttonhole styles, alphanumeric characters and custom stitch capability, you're not just sewing...you're creating "personal couture" with enough style and panache to satisfy the most demanding critic: you. Warranty	2/6/25 year premium warranty. See premium warranty for details. Machine Dimensions (H x W x D)	13.59" x 7.24" x 11.69"
Shipping Dimensions (H x W x D)	17.80" x 11.30" x 21.00"
Feet, seam ripper, needle set, twin needle, bobbins, eyelet punch, cleaning brush, screwdrivers, spool caps, accessory bag, stitch pattern plate and holder, instruction manual. Simply insert your bobbin pull the thread through the slot and you are ready to sew. No more "fishing" for bobbin thread. Save wear and tear on your eyes. No more searching for the eye of the needle. Incredible variety at your fingertips with built-in computerized utility and decorative stitches. Less eyestrain so you can better view your projects. Love this little machine I bought this machine to serve as a second machine when I travel south during the winter. After playing with it for a bit while still up north I fell in love! In fact, I liked this machine so much that I contemplated bringing my old Elna south instead of this one. In the end, I didn't ... but only because the throat space on this one isn't quite as large as the Elna. Neither machine is ideal for large top quilting, but both can handle smaller projects (up to twin+ blanket sizes) with ease if you roll them. 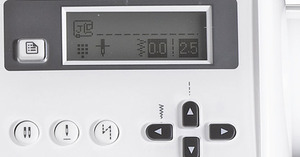 The stitch features on this machine are varied enough for almost any need. (Who really uses ALL of the decorative stitches that come standard, anyway?) The machine, while lightweight, is sturdy and solid as it sews. I've had zero problems with it so far, and am delighted that -since it is an older model- I was able to find it on sale for about half the usual retail price at my local Brother dealership. Don't be fooled by the "Project Runway" machines on sale at big box outfits ... they may not be the Innov-is and may not be as solidly built. Expertise Advanced Amateur. Use Home (Personal Use). Brother products owned 1. ✔ Yes, I recommend this product.